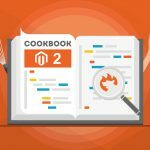 Among the drawbacks of Magento 2, there is the inability to display a price range for configurable products in Magento 2. Being absolutely distracted by this fact, we’ve decided to create our own solution that fixes the problem. Of course, developing a standalone module was absolutely unpractical, so the idea to add the lacking feature to the Improved Configurable Product Magento 2 extension was suggested. After a few months of hard work, we’ve introduced the update that allows you to display a price range for any configurable product. You only have to install the extension and enable a few settings in the backend. Note that the default price range is displayed as follows: ‘From [min_price]’, where [min_price] is the cheapest child product price. First of all, enable the ‘Price range at product page’ option – Configurable Product price will be replaced by the price range. Next, you can enable/disable the display of a native Magento 2 price block. If enabled, the block is displayed right below the price range. As for the ‘Enable From-To price format’ option, it defines if the price range should be displayed in the following form ‘From [min_price] – [max_price]’. As we’ve just mentioned, [min_price] is the price of the cheapest child product, and, as you’ve already guessed, [max_price] is the price of the top-priced child product. And you don’t have to specify these values manually. The Magento 2 Improved Configurable Product extension does everything automatically. 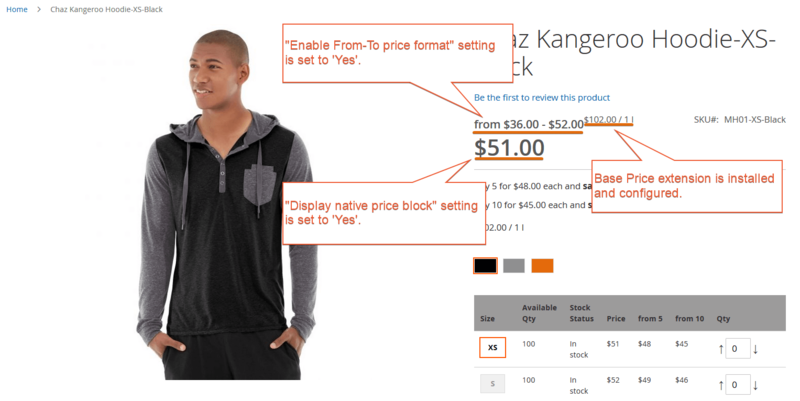 The screenshot below illustrates a product page with the following options enabled: ‘Price range at product page’ and ‘Enable From-To price format’. It is also necessary to mention that the Base Price module is installed and enabled. It is also necessary to mention that you can display price range for configurable products on a category page with our Improved Configurable Product for Magento 2. Enable the ‘Price range at category page’ and the configurable product price will be replaced with the price range. You can still display the native price block and use ‘From-To’ price format as in the aforementioned product page settings. Additionally, there is one more option – ‘Consider tier prices in From-To price format’. It defines whether [min_price] and [max_price] parameters of a price range should be taken from the tier price settings of child products. Once again, no manual configuration of exact prices is required. The ICP Magento 2 extension performs all calculations automatically. 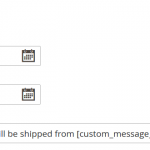 How to display custom shipping message per selected option on configurable product page in Magento 2? 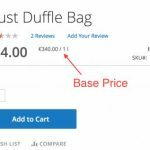 How to display base price per unit for configurable product in Magento 2? 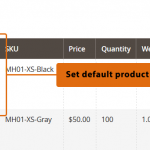 Homepage » Magento 2 » How to display price range for configurable product in Magento 2?